You think you got a hard grip on your vocabulary huh?, You think you can take on anybody when it comes to spellings and pronunciations?, you really think you can beat any of the best word games for android?, I doubt all these because below I have compiled a list of the Best Word Games For Android that will totally blow your mind out of the water. This category of Android games from the Google play store is a very educative and inspirational game category. Not only will you play and enjoy the game, but you will also learn new words that you might have learned before, but have totally forgotten. My list of Best Word Games For Android will completely bring to your remembrance all the cool words that got lost in your vocabulary, so dedicate some quality time in playing this game. You can even play this word games with friends, as many as the can be, brainstorm on words to align and complete all the challenges that will be put before you. So get pay close attention to the description of each word game on my list of Best Word Games For Android and find the particular word game that you prefer. Being a newer updated version of the previous release words with friends, new modes have been added to enable you to test your knowledge along with the Solo round if you want to test speed with friends or against a virtual person. Also available in different languages ranging from Italian to French to German to Portuguese to mention but a few. You can also have in-game conversations with your friends while you play the game. Engage yourselves in active gameplay as you take on your friends in the word of the day! Try the “LIGHTNING MODE” and be thrilled to your satisfaction. Why not try this beautiful delight and click on the button looking so cool down there to download and enjoy the game. A virtual replica of what Ellen DeGeneres does on her show, you now have the mobile version of that! Draw a new card buy simply tilting your phone you can play with lots of friends at once. Play with one friend or more friends in the multiplayer mode! Take screen records and share them right to Facebook or you can keep them for memories. Different categories to choose your questions from and a wider range to test your knowledge on. This is one game that much can’t be said about, but much can be seen about it. Download now! and experience the amazing fun in Heads Up. The concept of this game is quite simple and straightforward, 4 pictures are represented to you, simply make a word from what you see no complicated process, just from the very first second! Endless fun With new puzzles, easy, addictive, and simple to get the hang of or get used to, probably the most addictive game in the world. Available in 8 languages and over 22,000,000 users worldwide, don’t be left out, download now and enjoy nonstop word action, use the pictures that will be shown to you and derive just one word from it. Is that so much to ask? In this game, you are required to spin a wheel and see if you can solve the puzzles, also you can advance to bonus rounds and also try to conquer them. Challenge your friends and family to this game of words through Facebook. Tournament word games and multiplayer games available to too. Win big with Wild Card and or get lucky with Free Play with spin the wheel. This game is just 84mb in the installation size with over 100 million downloads. The fun just keeps getting better and better, with fun updates and feature that will keep you glued to your Android devices. Swipe to connect letters diagonally, horizontally, and vertically in order to score points based on a word’s rarity. You can equally compete with players worldwide. In this Xbox affiliated game, your progress is slowly but gradually measured by monitoring your best words found, best word count, first place finishes and more, you got two minutes, we got the game, ready when you are! Check out this game with much more than the eye can see to it by clicking on the button below, it won’t hurt to have more than one-word game on your Android device. It is the perfect game for those on the go, On the subway? In a train? At a social function. Want to catch some fun? Its simple just pull out your Android device and start tracing! Rotate the board at different angles. Can’t find the words? shake the phone to mix up the words and customize wurdle to suit your taste! Are there no more words trace? shake your phone and watch the tiles mix up and reset. Shake your phone and watch the tiles mix up and reset. This is an active word game with all the best features out there. A perfect game for those who love to let the world know how smart they are..real-time leader-board updates in this delight right here. Enjoy increasing your vocabulary by learning new words. Compete against thousands of other players and also add your friends via email or Facebook to participate! Have unending fun as the levels here are infinite, level up every time and keep playing, the fun never gets old. Be an expert in word games For Android and master the art of tracing random words to make meaning. The aim of the game is to improve your vocabulary by finding all the hidden words, it’s fun, addictive and interesting, discover hidden words from mixed letters, up to 800+ levels of increasing difficulty. Rank up as you proceed diligently, from novice chef to a master chef, top the leaderboard as the best and prove that you are not only a fast learner but that you are also a good wordsmith. A picture puzzle with the clues in the picture is a highly addictive game presented to you by Mag interactive, puzzle your way through a thousand words and find the answers right there in the pictures. Join over 30 million geeks and put your brain and wits to test in this mentally challenging game that requires you to find hidden words. Slide your finger over them and see the letters collapse. Its difficulty progresses as you go higher in levels, but always remember that no matter how hard a level may seem there is no problem without a solution. Do it all in the correct order and watch the grid clear successively!. Solve thousands of clues in the biggest and best crossword puzzle ever, there are over 10,000 unique clues to solve as well as dozens of quests to complete and trophies to collect. Explore a grid of over 350 puzzles, earn extra rewards with a snack-sized bonus puzzle each day. Choose from different modes ranging from Worlds biggest crossword, world’s tallest crossword and daily puzzle. This app is one of the Best Word Games For Android 2018 too, so don’t dull yourself, download now and enjoy nonstop word cross adventure with the World’s biggest crossword. Hey fella, I really hope you now have an idea of the Best Word Games For Android, that will suit your device better, try and download more than one to really benefit from this. These word games are to mention but a few, the vast selection of word games are there for you in the app store but like I said they are the best in the app store. So I strongly believe that you will make a nice choice. It totally won’t hurt to download more than one-word game from my list of Best Word Games For Android. 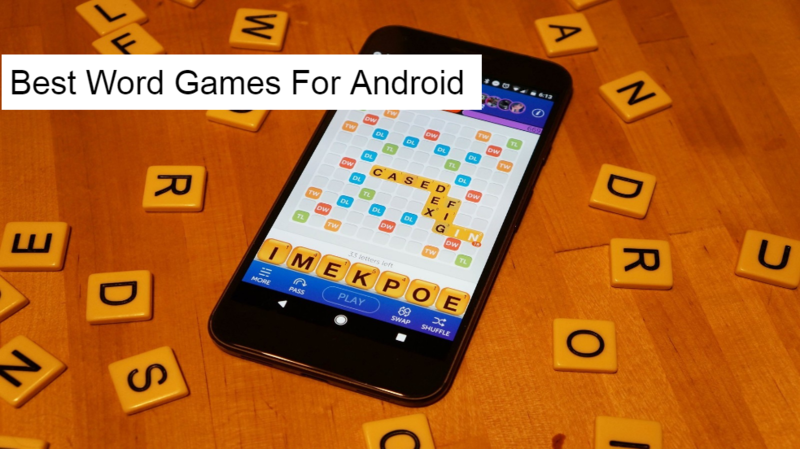 If you get tired of any one of the word games you may install on your Android device, which you won’t, you can easily open another one of the Best Word Games For Android on your phone and continue the fun on another platform. previous 12 Best Racing Games for Android | Realistic Car Racing Graphics! !